I feel a little annoyed that it took me so long to get around to watching Whip It (2009), because it’s a helluva lot better than it’s meagre box-office performance would suggest (it just about broke even). For those who don’t know, this coming-of-age comedy/drama/sports flick stars Ellen Page as ‘Bliss Cavendar’, a well-meaning misfit living in a small Texan town, who works at the local diner with her best-friend ‘Pash’ (Alia Shawkat), and spends her free-time participating in beauty pageants to please her rather retrograde mother (Marcia Gay Harden). One day, while visiting the fabled city of Austin with her Mom, she encounters a trio of roller derby gals, handing out fliers to publicise their next competition. 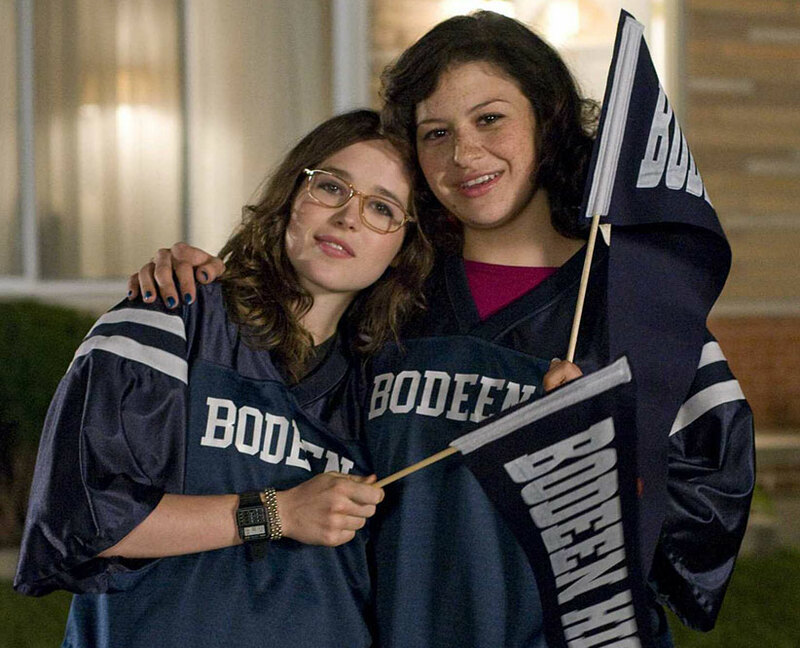 Intrigued, she and Pash sneak away to attend the event, where Bliss is inspired to try out for that evening’s losing team, The Hurl Scouts… because scrappy underdogs are always more fun, right? Unfortunately, she’s only 17, and knows that her parents won’t approve of such rough-and-tumble shenanigans, so she lies about her age, and uses the cover of Pash’s after-school SAT tutorial as an alibi… but she can’t keep the charade up forever, can she? Of course not… otherwise there’d be no tension, silly! It goes without saying that Page gives an incredibly endearing and intelligent performance here, as a young girl torn between her familial duties and her search for a new “tribe”, who can give her the space to find herself… and there are a couple of moments where she’s almost too adorable for words, such as when she’s making a “sad puppy” face to convince Pash to drive her to Austin, or waving a football team pennant to convince her parents to let her go see “the game” (their cunning cover story), or miming a little “doggy paddle” while stood on the side of a swimming pool. Bless. She also has a pretty cute and convincing double-act going with Shawkat, and it’s great seeing the two of them consoling and amusing each other. On the roller derby side of things, her team-mates include (first-time) director Drew Barrymore, moonlighting singer Eve, the mighty Zoë Bell (yay! ), and Kristen Wiig, as the maternal ‘Maggie Mayhem’, who urges Bliss (and viewers alike) to “Be your own hero!” Meanwhile, the villain of the piece, rival team captain ‘Iron Maven’, is played by Juliette Lewis… whose fellow (far less antagonist) opponent is ‘Eva Destruction’, played by Ari Graynor. All of the aforementioned actresses look smokin’ hot with their punky tattoos, hairstyles and outfits, and they make me wish we had a roller derby rink round these parts… I’d buy a season ticket f’sure! Fun fact: According to IMDB, Ellen Page dropped out of Drag Me to Hell to be in this. I’d always assumed she’d bailed on Sam Raimi’s horror flick because she didn’t fancy getting battered by all the stunts and SFX, but clearly that wasn’t the case because she must have picked up plenty bruises making this movie! Shame there isn’t a “making of” on the DVD, to show all the training and choreography the cast went through. This entry was posted in Rants about Films and tagged Alia Shawkat, Ari Graynor, Drew Barrymore, Ellen Page, Eve, Juliette Lewis, Kristen Wiig, Marcia Gay Harden, Whip It, Zoe Bell. Bookmark the permalink.